His companions and associates supported him in this matter: oligarch Rinat Akhmetov, prominent entrepreneur and politician Igor Kononenko, former deputy secretary of the National Security and Defense Council Oleg Gladkovsky, Prosecutor General Yury Lutsenko, Minister of Energy and Coal Industry Igor Nasalik, financier, ex-head of the NBU Valery Gontarev, Head of the State Fiscal Service of Ukraine (SFSU) Roman Nasirov, Deputy Head of the Petro Poroshenko Bloc, Yury Buglak, presidential adviser on financial matters, Boris Lozhkin, a businessman, former head of the National Commission for State Regulation of Energy and Utilities (NKREKU) Dmitry Vovk, Deputy Head of the State Property Fund of Ukraine (SPIU) Vladimir Derzhavin, as well as high-ranking officers in the ranks of the Security Service of Ukraine, the Interior Ministry and the prosecutor's office. Let's distinguish two directions. The first one is a cash reception based on the results of the activities of state enterprises, as well as companies in which the share capital is owned by the state. In this scenario, the withdrawal of finances is carried out either by transferring cash, or by bank transfers to the controlled offshore companies through Ukrainian firms, which are supervised by Igor Kononenko, Yuri Buglak and Roman Nasirov. The first direction also includes the disbursement of funds provided by the IMF and the IBRD, as well as the financing and support of strategic projects in industry and energy. The second direction is the acquisition of full control (share in management) or the privatization of strategic enterprises and high-yielding assets through their bankruptcy. Later, the accumulated cash is invested and the capital received is legalized. The key sectors of the economy, in which Mr. Poroshenko is interested - are energy (including hydrocarbon production), engineering and the banking sector. All funds raised during the implementation of various corruption schemes were partly used to support the work of the parliamentary majority, unofficial events, as well as financing the work of the controlled media. 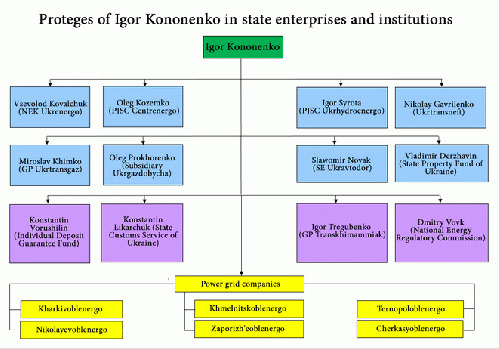 Kononenko's henchmen in state-owned enterprises and institutes are: Vsevolod Kovalchuk (NEK Ukrenergo), Oleg Kozemko (PJSC Centrenergo), Igor Syrota (PJSC Ukrhydroenergo), Nikolay Gavrilenko (Ukrtransneft), Miroslav Khimko (GP Ukrtransgaz), Oleg Prokhorenko (Subsidiary Ukrgazdobycha), Slawomir Novak (SE Ukravtodor), Vladimir Derzhavin (State Property Fund of Ukraine), Konstantin Vorushilin (Individual Deposit Guarantee Fund), Konstantin Likarchuk (State Customs Service of Ukraine), Igor Tregubenko (GP Transkhimammiak), Dmitry Vovk (National Energy Regulatory Commission). In addition, Kononenko is responsible for the operation of six power grid companies, in which the controlling stakes are owned by the state - Kharkivoblenergo, Nikolayevoblenergo, Khmelnitskoblenergo, Ternopoloblenergo, Cherkasyoblenergo and Zaporizh'eoblenergo. How's Donetsk coal supplied according to the Rotterdam Plus scheme? It is not a secret that the scandalous and well-known "Rotterdam plus" scheme has received the greatest scope. We decided to conduct our own investigation, in which we will try to uncover key points, present irrefutable evidence and the essence of the corruption scheme, and also reveal the list of persons and organizations directly involved. The main beneficiaries of Rotterdam Plus are Poroshenko and Akhmetov, who, in essence, divide the loot among themselves in a 50/50 ratio. Most likely, the ideological creator of the scheme was an oligarch Akhmetov, who has mines in the Donbass, while Poroshenko provided a state cover and the legalization of coal "purchases" at incredibly high prices. To achieve this, the Ukrainian president has created an energy empire. The State Property Fund organizes appointments to the supervisory boards of energy companies of supervised members (such as A. Vizir and O. Denisenko), provides control over financial flows and the alienation of property. The Ministry of Energy and Coal Industry approves the norms of coal reserves at TPP, initiates inspections of NAEK Energoatom at the moment when it is necessary to hide participation of high-ranking officials in corruption schemes. The State Fiscal Service (GFS) ensures prompt withdrawal and security of withdrawal of funds of companies and their conversion, provides data on companies that are counterparties on transactions in securities and services, hides the true figures for the import of anthracite from L/DPR and Russia, falsifies data on the import of coal according to the Rotterdam Plus scheme. Under the leadership of Roman Nasirov, GFS regularly conducted a comprehensive audit of operations and generated positive results. The National Anti-Corruption Bureau of Ukraine (NABU) conducts inspections and audits of companies involved in money laundering corruption schemes, appoints "perpetrators" and hides organizers. The Antimonopoly Committee does not notice signs of a monopoly in DTEK, which in the EU would be subject to separation with the establishment of a fixed yield of 20% (the so-called "natural monopoly"). The Security Service of Ukraine, the Ministry of Internal Affairs and the Prosecutor's Office of Ukraine, as well as their regional departments, organize inspections, prosecutions and initiate criminal cases against petty perpetrators of the fraudulent plans of the state's top officials, deputies and officials and "throwing a curve" on innocent citizens. The National Commission implements state regulation in the fields of energy and utilities (NKREKU) establishes the formula for calculating the tariff for thermal generation (the purchase of coal and the sale of thermal electricity through the Rotterdam plus system), approves investment programs for energy enterprises, distributes super-profits from the formula Rotterdam Plus in relation to 50/50 with DTEK. The largest generating energy companies, PJSC "Centrenergo" and DTEK, purchase power coal and natural gas at inflated prices, organize the withdrawal of own funds (the main profit from the scheme) and artificial bankruptcy of assets, hide the real amounts of profit received from the application of tariffs (conditions of coal purchase contracts are classified information, purchases are made without competition). NEK "Ukrenergo" artificially sets the maximum load mode for power units, creates an energy shortage, which increases the share of PJSC "Centrenergo" and DTEK in the total electricity supply to the grid. NAEC Energoatom provides guidance on the manipulations with the power units of nuclear power plants (in particular, with the Zaporozhye NPP, the largest in terms of capacity). Zaporizhzhya NPP organizes artificial inaction of the 1st and 2nd power units, and also increases the repair time of the 3rd and 4th. Oschadbank issues state loans to subsidize "unprofitable" energy companies to prevent their fictitious bankruptcy. SE "Energorynok" accepts generated electricity from generating companies, distributes it through Energoset Holding Company (also known as Energomerezha, a monopolist in the field of transmission and sale of electricity in licensing areas) to business representatives and the public, accumulates funds of domestic and industrial consumers of Ukraine, makes advance payments for electricity. The formula introduced by NKREKU from 2016 makes it possible to legally purchase coal at a price that is being formed on European exchanges. At the same time, the "European price" is much higher than the cost of coal from Russia, and even more from the Donbass mines. Is this scheme fueled by IMF loans? And then the country goes bankrupt, and its assets get sold to pay for the embezzlement. Similar schemes are probably carried out in America--mainly the military sector, the national security state and energy.